The charmed life I lead as a full-time tourist has its drawbacks. Manila is a radical departure from Seattle and the strong social ties my wife and I built during the seven years we lived there. The process of forging new alliances with strangers in a foreign locale has taken a toll. So it was with great anticipation and excitement that I collected our friends Amy and Bryce Rodda at a grimy concrete ramp outside the Ninoy Aquino International Airport just after midnight on February 11. The couple from Seattle set out on their maiden voyage to Asia, stopping first to see our Manila digs before joining my wife and I on a Presidents’ Day weekend getaway. It felt very refreshing to be in such good company. The four of us caught a flight to Taipei two days later. 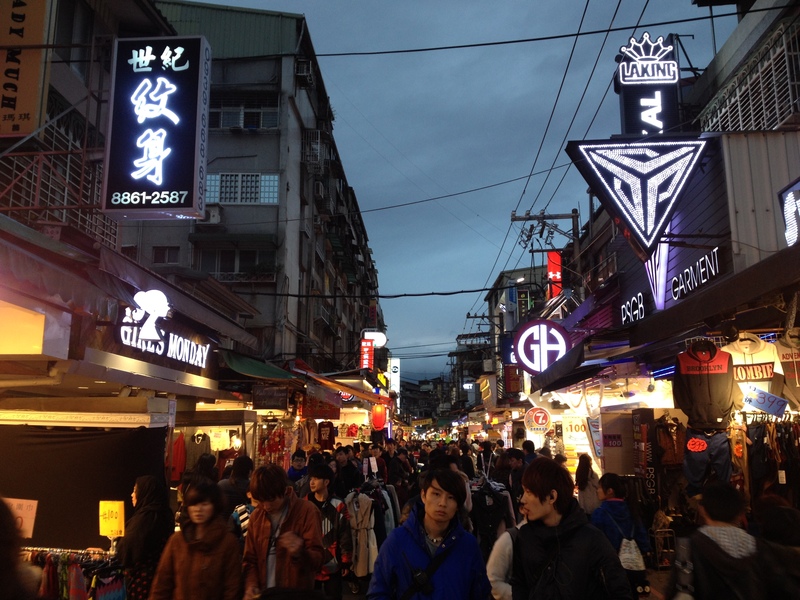 The Taiwanese capital draws fame for its vibrant night markets, its emergence as a high-tech hub and its history as a safe haven for Chinese mainlanders who fled the rising tide of Communism in the mid 1900s. The city’s odd array of street musicians register somewhere far below the radar of notoriety. 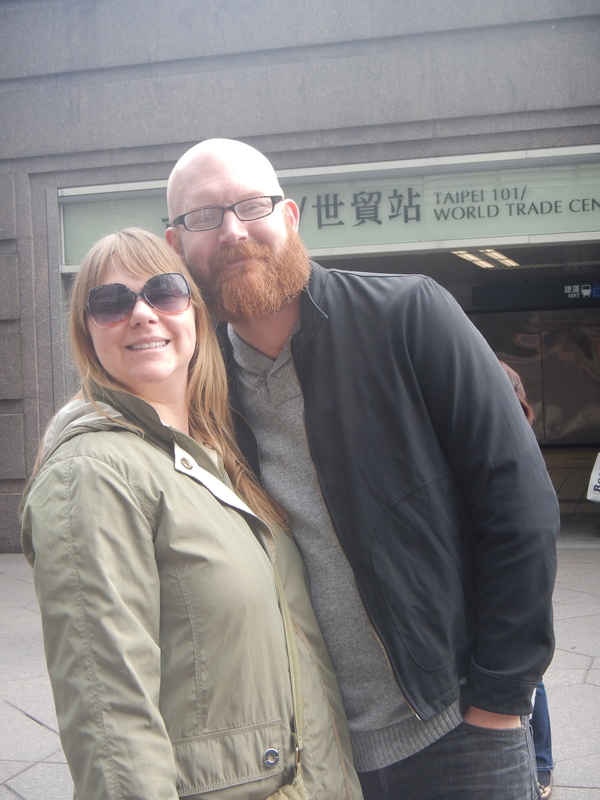 On the Saturday morning of our trip, Amy heard a familiar song off in the distance shortly after we got off the MRT line in Beitou, on the city’s northern edge. We followed the sound to a nearby courtyard and found an energetic man in a cowboy hat seated before a keyboard and a microphone he’d set up. The musician immediately picked up on our presence and greeted us in English, introducing us to a small gathering of people who politely applauded. In an ode to Credence Clearwater Revival, the man jammed on the keys—often raising a pointed index finger skyward for emphasis—crooning along to an abbreviated rendition of ‘Lodi’ seamlessly followed by ‘Proud Mary.’ I joined in at the chorus, recognizing the words of John Fogerty reimagined with a thick Mandarin accent. The previous evening, we flexed our vocal muscles at a karaoke joint called Cash Box Partyworld. Taking the the mic in the private room we rented, I improvised lyrics in a pathetic falsetto to the ABBA classic ‘Dancing Queen’ (“You are the dancing king, young and sweet, only 33…”) while Bryce bravely attempted a Mandarin greeting via phone in an effort to summon a fresh round of drinks (“Ni hao,” Bryce said into the receiver, to an explosion of laughter from the staffer on the other end of the line). But the night belonged to Amy. She blew us all away, chopping and kicking through her blistering version of ‘Kung Fu Fighting’ by Carl Douglas. After we’d had our fill of the Beitou courtyard performance, we wandered around the side streets in search of lunch with vegetarian menu options to accommodate Amy. This task proved incredibly challenging given the language barrier and our point-and-mime method of communication. After an hour of searching the neighborhood without success, we walked uphill and found the Man Ke Wu ramen noodle shop and fell in at the back of a long line that wrapped around the side of the building. 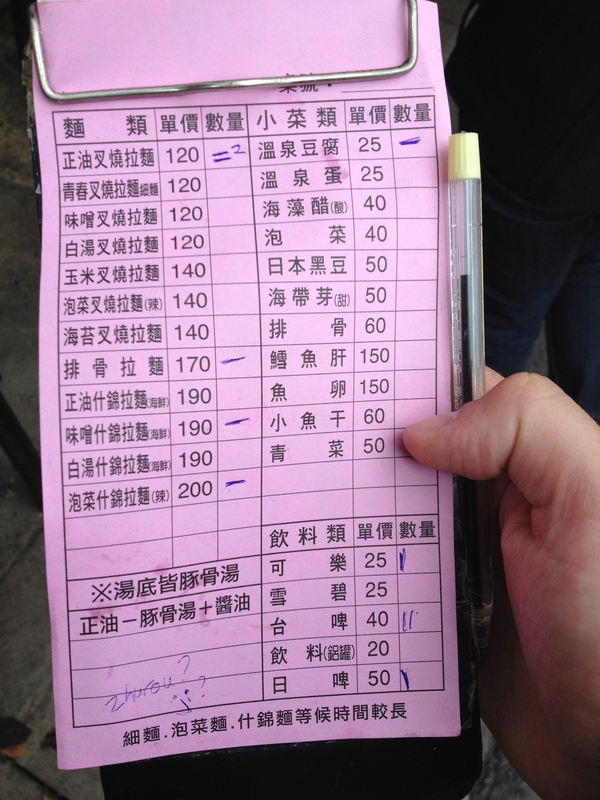 A waitress handed us a small pink menu without illustration, a rectangular grid of Mandarin characters and prices. Fortunately, a young Taiwanese couple just ahead of us in line spoke English and offered to translate. Eventually, the waitress came back to get our order and herded us inside the tiny restaurant to a table along the back wall. The dining room had a maximum capacity of maybe 25 occupants and was unadorned, save for the napkin dispensers that hung on the walls. Conversation in the room was limited to a dull murmur. Patrons focused solely on devouring the steaming bowls of soup in front of them. Our food arrived quickly. In the name of sustenance, Amy gracefully allowed herself to deviate from her normal vegetarian regime with a bit of shellfish. Sated and happy, we walked outside for a soak in the public hot spring located just down the road. The place consisted of a vertical series of four thermal pools set into a paved hillside. The Taiwanese weekenders were out in full force, resulting in packed pools and long lines at the gender specific shower stalls at the bottom of the hill. We each had to stalk those in the process of leaving and aggressively jockey for position in order to acquire vacant lockers. Water temperature increased with elevation: the pool at the foot of the hill was about 95 degrees Fahrenheit (35 Celsius); the uppermost pool was near scalding at 113 (45 C). The water is widely lauded for its therapeutic effect on a variety of skin diseases. I struggled to hit the two-minute mark in the hottest pool before retreating downhill. Back on the street afterward, we walked further uphill to check out the water’s source from the Beitou Thermal Valley. 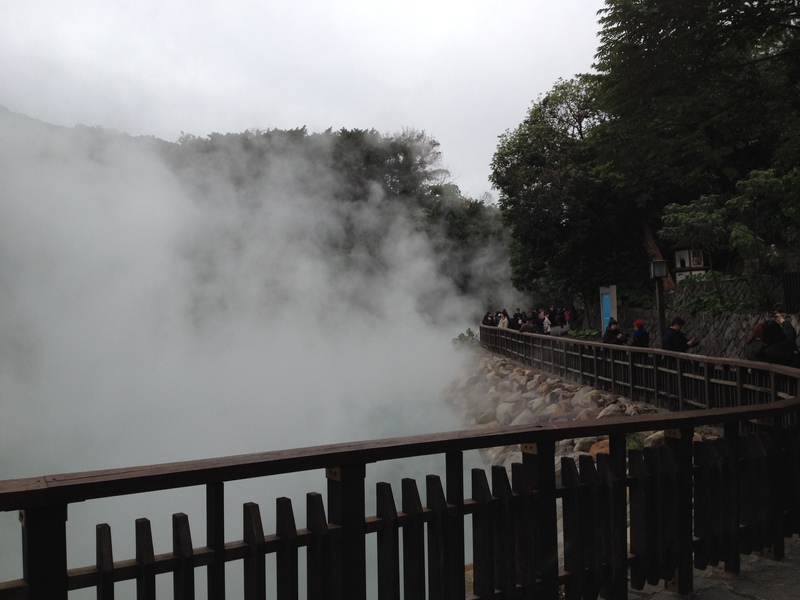 The green sulfur spring bubbling up from the volcanic crater can reach a near-boiling temperature of almost 200 degrees (90 C). The rocky creek bed leading down from the spring bore a green tint and steam rose up from the crater in dramatic fashion. The next morning—our last in Taipei—the heavy clouds and intermittent rain that persisted throughout the weekend let up a bit. The sky remained overcast, but visibility was decent at last. The running joke up to that point had been that the Seattle weather followed our friends to the Far East. We took the clearer skies as a sign from the weather gods and made our way over to the red line of the MRT en route to Taipei 101. The building debuted in 2004 as the world’s tallest and has since fallen to third place at 1,667 feet. 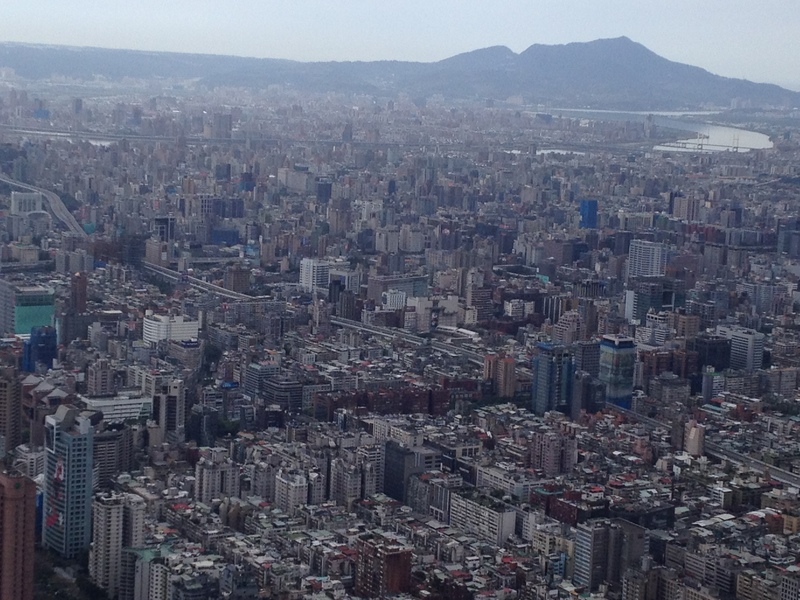 We peered out at the bustling metropolis from the observation deck on the 89th floor. Notable facts concerning the development of the city were fed to us via multi-lingual remote control devices we held up to our ears. One small sign in a windowsill apologized for routine maintenance, helpfully suggesting the proper etiquette visitors should display when encountering it. We saw no window washers and needed no prompting from a sign regarding photography. We took turns goofing off in a photo booth, quizzing one another about our favorite parts of the trip. Before we left, we climbed a set of stairs that led to the 91st floor and emptied out to an open air viewing area. For the first time all weekend, the sun finally broke through the clouds. I love Mandarin Fogerty! You can be stuck in Lodi ANYWHERE!